Wide surgical excision remains an accepted mode of treatment; although, radiotherapy is advocated by some authors. 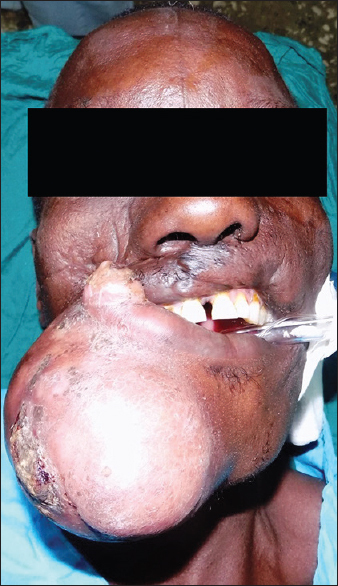 More recently, the use of imatinib has been promoted in the management of advanced cases with metastatic lesions., To the best of our knowledge, this is the first report of a case involving the maxillofacial region from sub-Saharan Africa. A 42-year-old male presented at our clinic with a slow growing, painless, and facial mass of 8-month duration [Figure 1]. He had surgical excision of a similar but smaller mass in the same anatomical region, 18 months before the presentation. However, the histological report was not available. Examination revealed facial asymmetry which was due to a bulbous, firm, and nontender mass extending from the midline of the lower lip to the right oral commissure mediolaterally and from the lateral third of the upper lip to the mentum superoinferiorly [Figure 1]. The overlying skin exhibited areas of patchy hypopigmentation and also showed differential warmth. An area of ulceration which measured 0.9 cm × 1.4 cm was observed. The ulceration was covered by a dark-brown scab [Figure 1]. Examination of the submandibular, submental, and cervical lymph nodes revealed no clinically positive lymph node. Baseline investigations such as electrolyte urea and creatinine and full blood count gave satisfactory results that were within the normal range. Posteroanterior view and true lateral views of the jaws did not reveal any bone involvement. Based on the history, which was suggestive of recurrence, an excisional biopsy with wide margins was done under general anesthesia [Figure 2]. The resulting defect was surgically reconstructed by utilizing a combination of the Karapandzic technique of lip reconstruction and the platysma flap [Figure 3] and [Figure 4]. The excised tissue specimen was sent to the histopathologist in our center, who received an ulcerated nodular tissue with a gray solid cut surface. Sections were partially embedded after routine processing with paraffin embedding and hematoxylin and eosin stains which on light microscopy showed a deep-dermal nodular cellular mesenchymal neoplasm with spindle cells admixed with histiocytic cells having bland nuclei and disposed in fascicles with storiform areas, consistent with a DFSPs [Figure 5]. Subsequently, the patient was referred to the oncologist for radiotherapy. Postoperative reviews have been satisfactory with a patient having acceptable aesthetics [Figure 6]. The patient has been followed up for 13 months without any sign of recurrence, and he is still being followed up. Stivala et al. in a 12-year study of 59 cases of DFSP, reported an overall female preponderance. However, this report features a male patient. 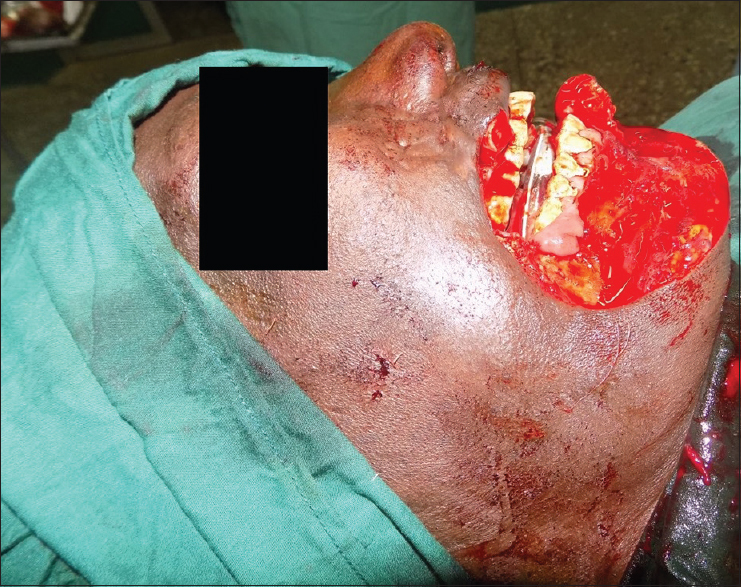 Of the 59 cases studied, only two involved the oral and maxillofacial region. This further validates the rarity of this tumor in the oral/maxillofacial region. It is frequently seen on the trunks (42%–72%) and the proximal extremities (20%–30%), when it occurs., Proposed predisposing factors to the development of DFSP include trauma and previous irradiation. There was no history of previous irradiation in this patient; although, he had previous surgical excision of an unknown tumor in an adjacent site before the presentation. Perhaps, repeated low-grade trauma which the patient may have overlooked could have played a role in its occurrence. DFSP has an inclination for local aggressiveness and recurrence, especially when inadequately excised.,, Its propensity for recurrence is believed to be associated with the manner in which the cells are arranged in a radial fashion around an acellular core. These peripherally positioned cells may be the loci for recurrence. The traditional mainstay of treatment is wide surgical excision of the mass but adjuncts to this are fast emerging., To curb recurrence, the frozen section may be utilized in an adjunctive manner to ensure the complete removal of the tumor. Frozen section was not done in this case due to the limited resources in our climes. Moreover, some researchers have touted the effectiveness and precision of Mohs micrographic surgery in reducing the rate of recurrence. 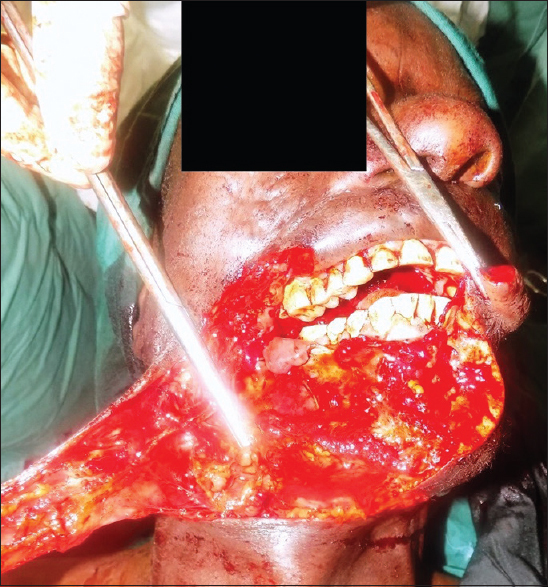 Surgical management of soft-tissue orofacial tumors often poses an esthetic challenge., This is especially so in patients with DFSP, where wide tissue excision is advocated. 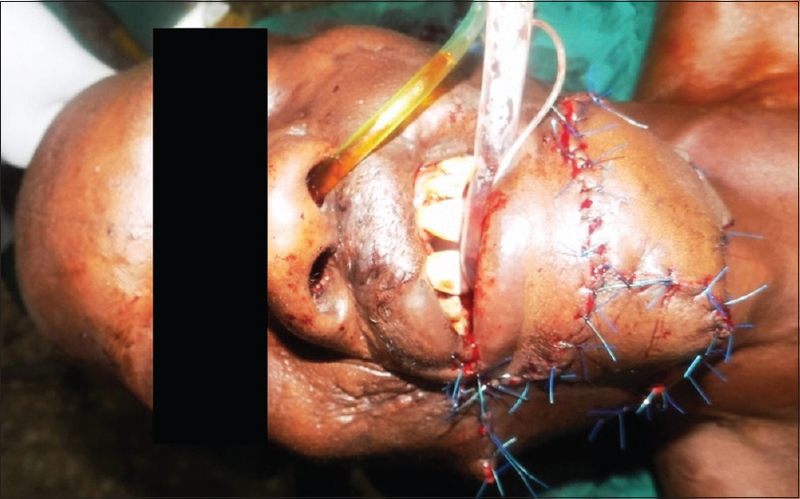 Surgical excision, in this case, resulted in a gaping tissue loss, which was challenging to close. Reconstruction of the postexcision defect was done using a combination of the Karapandzic technique for lip reconstruction and the platysma flap. This resulted in acceptable esthetics postoperatively. Although dermatofibrosarcoma of the maxillofacial region is rare, the possibility of its occurrence should never be underestimated. Surgical excision aimed at eliminating all tumor cells remains the principal mode of treatment. Nevertheless, other treatment modalities of treatment are emerging. Chang YH, Chen YW. Surgical treatment of dermatofibrosarcoma protuberans on right face. J Dent Sci2017;12:311-2. Stivala A, Lombardo GA, Pompili G, Tarico MS, Fraggetta F, Perrotta RE, et al. Dermatofibrosarcoma protuberans: Our experience of 59 cases. Oncol Lett 2012;4:1047-55. Lee OJ, Pi DY, Jo DH, Cho KJ, Kim SY, Ro JY. Dermatofibrosarcoma protuberans of the parotid gland. Korean J Pathol2004;38:276-9. 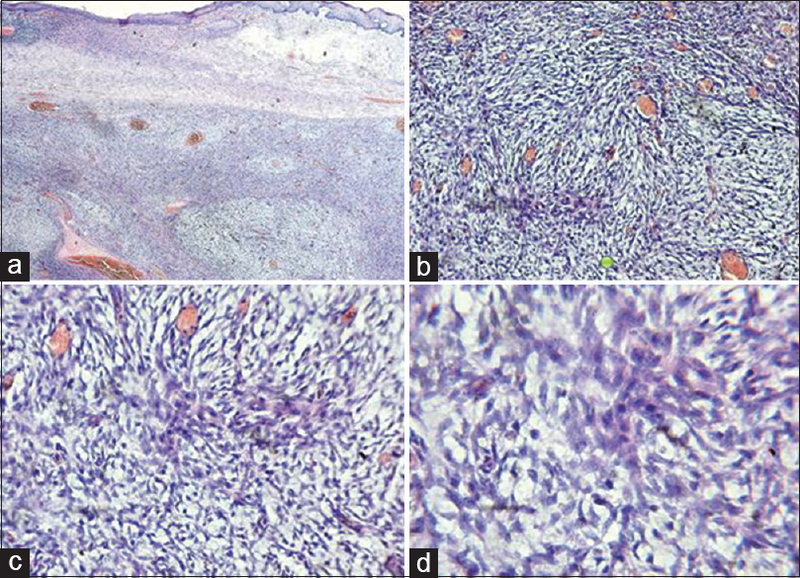 Van Der Rijt R, Moradi P. Dermatofibrosarcoma protuberans: A rare cutaneous tumour. J Surg Case Rep 2012;2012:8. Baker PA, O'Dowd GJ, Khan IU. Dermatofibrosarcoma protuberans arising in a decorative tattoo. Sarcoma 2005;9:37-41. Kumar L, Bhandari V, Singh S, Garg P, Kumar A. 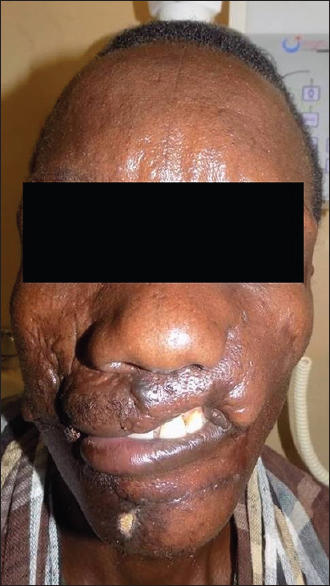 Giant dermatofibrosarcoma protuberans: A rare presentation over face. J Cancer Res Ther 2015;11:1038. Gupta AK, Singh HA, Manalel AM, Jaiswal NK. A rare case of scalp dermato-fibrosarcoma-protuberans with intracranial extension and distant soft tissue and liver metastasis. Calicut Med J2011;9:8-11. McArthur GA, Demetri GD, van Oosterom A, Heinrich MC, Debiec-Rychter M, Corless CL, et al. Molecular and clinical analysis of locally advanced dermatofibrosarcoma protuberans treated with imatinib: Imatinib Target Exploration Consortium Study B2225. J Clin Oncol 2005;23:866-73. Kim GK. Status report on the management of dermatofibrosarcoma protuberans: Is there a viable role for the use of imatinib mesylate? In which cases may it be therapeutically helpful and in which cases not? J Clin Aesthet Dermatol 2011;4:17-26. Stojadinovic A, Karpoff HM, Antonescu CR, Shah JP, Singh B, Spiro RH, et al. Dermatofibrosarcoma protuberans of the head and neck. Ann Surg Oncol 2000;7:696-704.